While reading the July 1816 edition of the Repository of Arts, Literature, Fashions, Manufactures, etc, I came across a letter written by a certain Susan Strivewell about her life as a servant. I’m never sure if such letters were real or made up (I also wonder whether the letters modern magazines print are really written by their readers! ), but either way, it offers an interesting insight into the life of servants in the Regency era and what they had to put up with. Here it is, enjoy! As my lady is a subscriber to your Repository, I have an opportunity of seeing it; and observing some time ago a reflection made by one of your correspondents— “that if servants were to be heard in their turn, they might also be found to have some cause of complaint;” I thought that my history would prove the truth of this reflection, and I have taken the liberty to send you some account of it. My parents were very poor people, who had some difficulty to spare the money necessary to send me to a day school; reading and writing were consequently the sum of my acquirements. My mother, who was very notable and industrious, took care to qualify me for service, but I had the misfortune to lose her before I attained my sixteenth year; and my father survived her only a few months. This severe loss rendered me for some weeks incapable of doing any thing; but an aunt to whose house I went on the death of my parents, soon reminded me of the necessity there was for my getting my bread, and as she had a cousin settled in London, she gave me a letter to her; paid the expenses of my journey to town out of the money produced by the sale of my parents’ few effects, and I set out from home, with many charges to be a good girl, and many wishes for my success in getting a situation. I wished if I could to get a place as lady’s maid, but my cousin told me, she feared my being a country girl might be an obstacle, and advised me to go after a situation as housemaid; and finding there was one wanted at Mrs. Rigid’s, I went to offer myself. Mrs. Rigid, who was an old lady, put on her spectacles and surveyed me for some time without speaking; at last she asked me if I was not ashamed of myself to come after a housemaid’s place dressed in such a ridiculous manner (my dress I should tell you, sir, was a black stuff gown, a black silk handkerchief on my neck, and a straw bonnet with black ribbons). “When I heard you was a country girl,” pursued Mrs. Rigid, “I was in hopes of seeing a decent comfortable person, dressed as servants were in my young days, but instead of that you are as fine as any London madam of them all.”—”I will dress in whatever manner you please, ma’am,” replied I, “if you will have the goodness to take me into your service.”—” Not I, indeed !” cried she; “there are places that may suit you, but I am sure mine is not one of them.” I attempted to reply, but she angrily ordered me to get about my business, and I returned to my cousin very much dejected. She desired me not to make myself uneasy, for she was pretty sure I should not meet with another lady who would find fault with my dress; and as there was a children’s maid wanted at Doctor Doublefee’s, I went after the situation immediately. 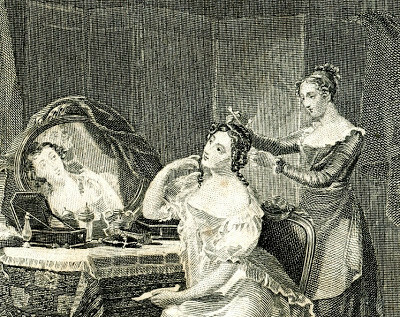 I was shewn into an elegant apartment, where Mrs. Doublefee sat reading; she turned round on my entrance, and surveying me with a look of contempt, “Pray, young woman,” cried she, “what do you want?” I stammered out, that I came to offer myself as children’s maid. “Then you have a great deal of assurance,” said she; “do you suppose I should suffer my children to be waited upon by such a vulgar-looking, ill-dressed creature as you? Why I should be ashamed to see my scullion in such clothes; a rusty old stuff gown, and a nasty coarse straw bonnet!” —”They are my best at present, madam,” replied I, ” but I will buy others, if you wish it.”—” What, I suppose you think then, that if you had one decent suit of clothes, that would be sufficient for a place like mine! I never saw so much brass in my life. Go, you had better offer your services at a public-house; ’tis the only place you are fit for.” I was too much dismayed to attempt any further excuse, and I returned almost in despair. One would suppose I had been asking charity instead of a service, from the difficulty I had in getting a place. Some ladies thought me too young; others were afraid I was not smart enough; some told me they were determined never to take country girls, because they had had several, who all turned out very bad: others preferred country girls, but then they must have lived two or three years in service in the country. At last, when I was beginning to despair, I heard of a situation as attendant on two young ladies, sisters, and although the place was said to be a very hard one, I went after it directly. As soon as I entered the room where they were sitting, the youngest said to her sister, “Why, Lord! Harriet, this girl’s a mere country dowdy, and I am certain she is good for nothing.”—” How do you know what she is good for?” replied Miss Harriet. “Come here, child, and let me speak to you.” She then began to inquire what I could do; but I was so frightened at what her sister had said, that I gave a very poor account of myself: nevertheless, she hired me, more I believe out of opposition to her sister, than from any other motive. I went home the following day quite elated to think that I had got a place at last; and as I knew that I really could do every thing that Miss Harriet required of me, I was resolved to convince her sister, that the country dowdy was fit for something. But before I had been a week in my place, I saw clearly that it would be impossible for me ever to give satisfaction to my two mistresses, for whenever the one gave me any thing to do, the other was sure to set me about something else. 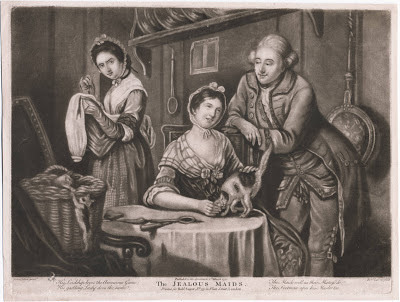 I had agreed to wait upon them both, to wash all their small linen, and do what needle-work I could at my leisure. Miss Sophia, the youngest, having taken a dislike to me, complained continually that every thing I did for her was wrong: if I dressed her, she had not patience with my awkwardness; whatever pains I took in getting up her muslins, she never found them fit to be worn, and she protested I did not do one quarter of the needle-work she wanted. Miss Harriet was displeased with me, because she thought I paid more attention to her sister than to herself. “It was always the way,” she said, “that she was imposed upon by servants; these creatures knew the easiness of her temper, and they took advantage of if but she was determined to be no longer a cypher, but to have proper attention paid to her orders.” It was in vain for me to say, that I wished to do every thing in my power to please her, she constantly declared I did not take the least pains to do it; and at the end of six months she discharged me, because, she said, I added insolence to ingratitude, in declaring it was not my fault if I did not give satisfaction. As my place had been truly uncomfortable, I was not very sorry to lose it; but I resolved, that, in taking another, I would be careful to have but one mistress. In a few days I was engaged as maid to Mrs. Tempest, who told me when she hired me, that I should find her a good mistress, if I deserved it, but I must not mind being scolded now and then, for she was rather passionate. As I had been scolded continually for six months before, I thought I should be very well off in being scolded only now and then, and I went home in very good spirits. For a whole week my mistress behaved so kindly to me, that I thought myself the luckiest creature in the world; but one day having the misfortune to break a smelling-bottle, it put her into such a passion, that she snatched up a heavy china water-jug, and threw it at me. Luckily it missed me, but I was so terrified, that although she condescended to say she was sorry for it, I quitted her the next day. Mrs. Thrifty, my next lady, made some difficulty of engaging me, because I wished, to stipulate for leave to go to church, and sometimes to see my cousin: with respect to the first, however, she said she would spare me when it suited her convenience (which I must observe was only once during nine months that I lived with her); but as to the latter, she neither allowed her servants to go out, nor to have any followers. 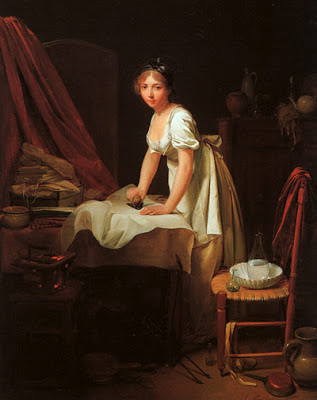 This lady, who was rather in years, and had no family, was very notable, and as she frequently said, that idleness was the mother of mischief, she took care to keep every body about her employed. Finding that I was a good needle-woman, she gave me plenty of work, and from six in the morning till eleven or sometimes twelve at night, I laboured without intermission. However, as my mistress was not ill tempered, and sometimes encouraged me by saying I did more needle-work than any other servant she had had, I bore the hardships of my place very well. One day while I was sitting at work in my lady’s dressing-room, my master entered, and asked where she was. I told him, I believed in the drawing-room, and inquired whether I should let her know that be wanted her. “No,” cried he, “my business is with you: ’tis a shame that so fine a girl as you are, should be labouring in this manner from morning till night; I have a plan in my head to render you more comfortable.” I replied, that I was as well off as I wished to be, and I turned directly to leave the room. He got between me and the door, and attempted to catch me in his arms. I repulsed him very angrily, and at this moment my mistress came out of her bedchamber, which communicated with the dressing-room. My master vanished in a moment, and she began, with passion, to abuse me in the most violent terms: I was a vile dissembling hussy, an artful hypocrite; this was my sanctity, forsooth, to inveigle a married man! but she never knew any pretenders to religion but what were wicked in their hearts. However, she had heard all that passed, and she would take care that I should not gain admission into another family, to disturb the peace of it, as I had done her’s. “If you heard what passed, madam,” cried I, “you must know that I am not in fault, and that the blame is entirely my master’s.” At these words her passion rose beyond all bounds. “Was there ever such insolence!” cried she, “to dare to blame your master! as if all men will not take liberties with such forward, vile creatures as you are.” She ran on in this manner till she was out of breath, and then throwing me my wages, she desired I would take my rags, and get out of her house directly. I went immediately to Mrs. Terripest, who had the goodness, on hearing my story, to say she would get me a situation; which she very soon did, with a widow lady, who told me when she engaged me, that she wanted little personal attendance, and did not require needlework; but she wished to have a trusty person who would act as housekeeper, and on whom she could depend to let nothing be wasted in the family. This last part of my office, however, was a sinecure, for she took care to keep her house in such a manner that we should have nothing to waste. She made it her business to know the very lowest prices of all sorts of provisions, and as she bought every thing for ready money, she always took care before I went to market, to tell me what each article was to cost; and as I did not dare to exceed the price she mentioned, I was in general obliged to buy the worst of every thing, and my mistress was in consequence always dissatisfied with me. She never saw such bad provisions, she said, in her life; it was impossible for her to eat such trash, it was only fit for dogs. If I told her it was because I was fixed to a price, she insisted upon it, that I might have purchased the best meat, &c. for the same money: but she supposed I was too fine a lady to try to get bargains; I did not care how dear I bought every thing, because they cost me nothing; and sometimes she has asked me, whether I was quite sure that I really gave that price for the article. As I had been brought up in the strictest principles of honesty, I was much mortified at these speeches, and one day I could not help saying, that if she suspected me, she did wrong to suffer me to lay out her money. This speech produced such tart reproaches for my pertness, that I burst out a-crying. My mistress ordered me to quit the room, and not make myself so ridiculous; she had said nothing that ought to hurt my feelings, if I was innocent, and she had no notion of servants affecting sensibility. Thoroughly dissatisfied with my situation, I now began to inquire for another. 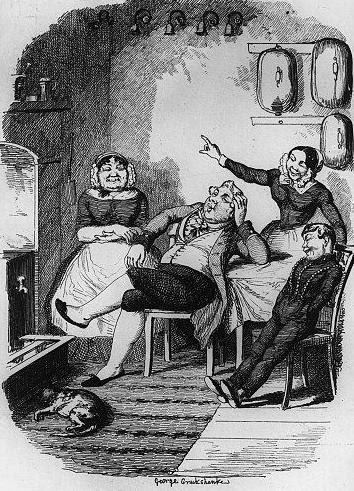 “Miss Meanwell wants a servant,” said one of our tradespeople to me, “but I don’t think you would like the place; she is an old maid, keeps very little company, and I fancy is either poor or stingy.” Notwithstanding this unpromising account, I waited on Miss Meanwell, who engaged me directly. It is now more than ten years, sir, and I have lived with her ever since, and shall, I hope, continue to do so till my death or hers. I have not what most servants would call a good place, for my wages are small, and as my mistress dresses in the plainest manner, I have few perquisites; but she always treats me kindly: if through mistake or inattention, her orders are not properly executed, she reproves me, but without severity. She told me when she engaged me, that as she kept only two servants, I should have some things to do which perhaps I had not been accustomed to, and she never suffered her servants to say, “It is not my place,” or, “I was not hired to do that:” but as she is very regular and methodical, I soon learned the duties of my station, and it happened sometimes that I did more than was expected from me; whenever that was the case, I was sure to be commended, and to receive some little reward, not money, but some trifle that would be useful to me, or perhaps a book calculated for servants. My mistress allows me to go regularly to church, and now and then I have leave given me, to ask my cousin to come and see me, or else I go to see her. 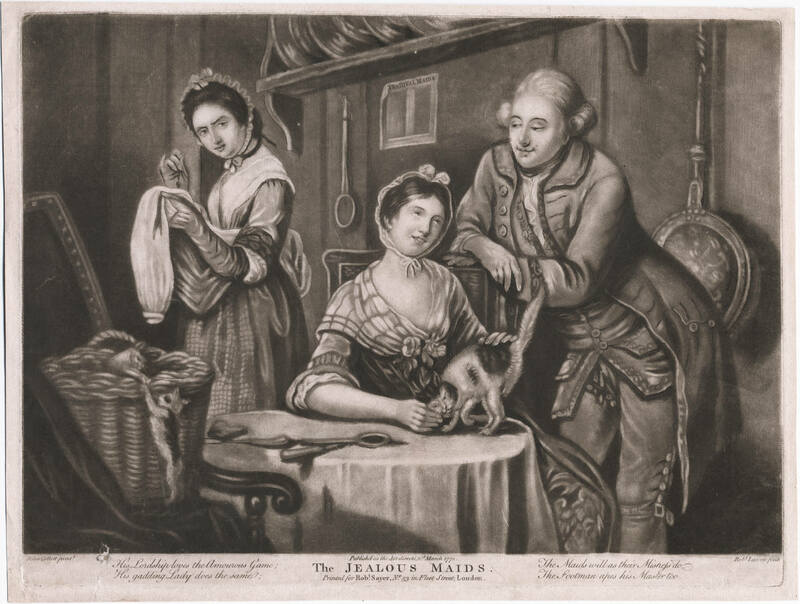 Soon after I went to live with Miss Meanwell, I was taken dangerously ill, and she had herself the goodness not only to see that there was proper care taken of me, but even to pass an hour or two at a time in my room. She thinks I have shown my gratitude by refusing to leave her to live with Mrs. Flareit, whose woman has the most easy and lucrative place in town; but I would not change to serve a princess; and I believe, sir, that, discontented and fond of changing as servants in general are accused of being, there are few who, if they were treated as I am, could be wholly insensible of the kindness shewn to them: but I cannot help thinking that we are like children—excessive indulgence, or too great severity, is equally prejudicial to us; and there are few mistresses who, like Miss Meanwell, take care to avoid the one and the other.